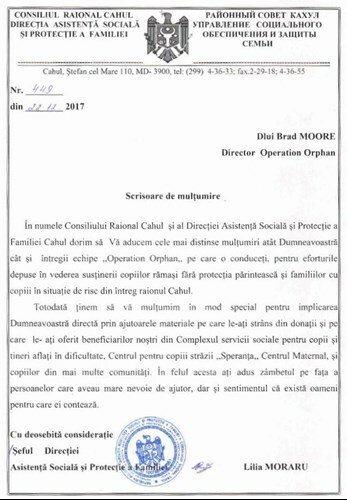 On behalf of the Cahul District Council and the Social Assistance and Family Protection Division in Cahul we wish to offer you the most distinguished thanks to you and to the whole Operation Orphan team you are leading for your efforts to support children without parental protection and families with children in a situation of growth from the entire district of Cahul. We also want to thank you for your direct involvement with the material help you have donated and provided to our beneficiaries in the Social Services for Children and Young People in Difficulty Center, children of the street, Hope, Maternal Center, and children from several communities. In this direction you have brought the smile on the face of the people in need of help, but also the feeling that there are people for whom they matter.